The Visual Science Lab / Kirk Tuck: Day by day packing for lights. Day by day packing for lights. I went on location today. I was in a mid-sized conference room making portraits of four men in coats and ties. One after the other. The camera portion of a job like this is hardly a big mystery and really, any camera that allows you to change the lens and use a focal length that is somewhere near the equivalent of 85-90mm (on a full frame, 35mm camera) will probably suit you just fine. The predominant use for the images will be on a website and, really, just about any camera made since 2004 should do a decent job delivering a sharp, mostly happy file. It's always the lighting that's more interesting. 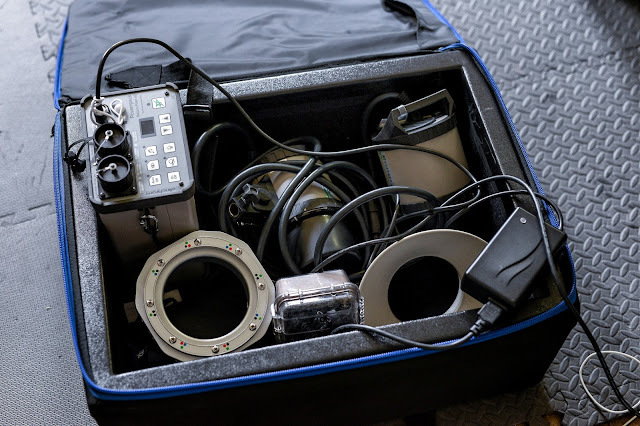 Last year I might have taken my case with three of the Elinchrom monolights and used them for the project but it seemed like so much overkill to haul the big case up the stairs, plug multiple cords into wall sockets, piece together a softbox and a speed ring and decide where to put it all. Since last year the folks at Cactus sent me an RF60 flash unit and three of their V60 triggers and after I figured out how to use them they way I like to light stuff I've honestly been trying to shoe horn most of my interior shoots into minimalist lighting scenarios. I've been throttling down the size of my modifiers in an attempt to make my light a little harder. Given the high dynamic range of the Nikon D610s and D810 I don't really need to worry about softening the highlight transitions as much. When I don't have to worry about burned highlights I can spend more time getting a harder, more dynamic feel to the light. After working with friend Frank and seeing a couple of the modifiers for small flash that he uses I decided to pick up a Westcott light modifier called a Rapid Box Duo. The model I got is basically a 32 inch octagonal softbox that sets up much like an umbrella and provides several levels of diffusion as well as a little metal dish one inserts into the softbox to help spread the light from a small, electronic flash evenly across the front diffusion of the modifier. The box takes a couple of minutes to set up and most of that time is putting together the two piece flash holder that couples the flash to the soft box and the whole set up to a light stand. I use the Rapid Box about six feet from my portrait subjects and it gives me a harder light with more contrast than the much larger diameter umbrellas and soft boxes I have generally used. The Cactus RF60 flash is a perfect companion for the quick box because it uses an internal radio trigger and the power levels of the flash can be remotely controlled by the V60 trigger sitting on the camera. At a quarter power I get quick recycling and lots of flashes from a set of Eneloop batteries. Today I used a second flash in a 48 inch umbrella with the power dialed down low (1/32th) to add just a bit of fill to the shadow side of my subjects' faces. That flash was also triggered by a V60 transceiver. I chose a shutter speed/f-stop/ISO combination that would give me a perfect exposure with the sun lit trees outside the windows of the office and then brought the flash exposure in line to match that level. Takes longer to write about it than to do it. And that brings up my shoot from yesterday. I have a client who like to have portraits made of their board of directors and their senior executives outdoors with lots of out of focus green in the background. Last year we shot for them on a day with gusty wind and direct sun. Yesterday the Photo gods met me half way and just delivered the hot, direct sun....no wind to speak of. But trying to over power direct sun is different than matching the lively green on foliage outside a tinted window that also has solar screens. 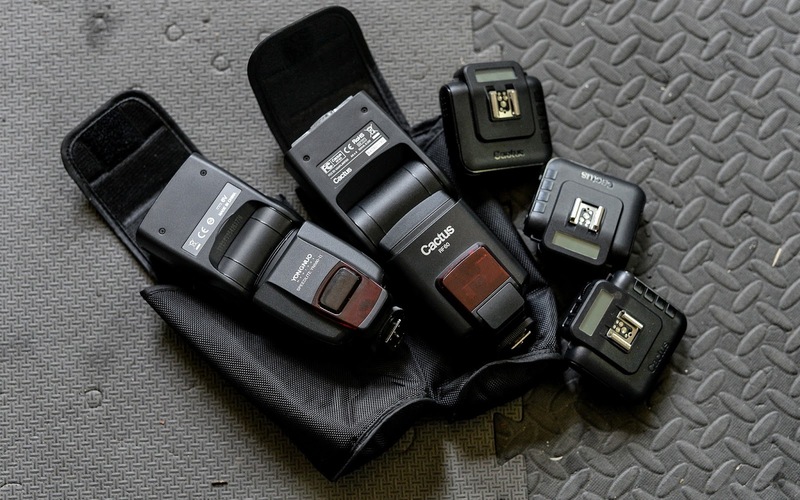 In a true, outdoor setting you generally need a flash with a lot of power and, if you are shooting more people than you can count on one hand you also need an electronic flash that has lots of electrical capacity. Yesterday's lighting kit was the antithesis of this morning's light weight assemblage. Here's why. I wanted a 4 foot by 4 foot black flag to take the direct sun off the subject. This required an extra tall Century stand that can be raised as the sun climbs in the sky. A stand with a 4x4 floating up ten feet in the air can do a lot of damage if it comes down in an uncontrolled fashion so I also needed two twenty pound sand bags on the stand to keep my insurance agent happy. That takes care of managing the direct light but I also have found it a very good practice to put another 4x4 foot, black flag directly behind the camera so that the subject's eyeline is aimed at something that won't promote squinting. I don't want to get hit by a falling stand any more than the next person so I want to make sure there are 20# sand bags on that Century Stand as well. The third Century stand held up an Elinchrom S head, fitted with a 30 by 40 inch softbox. The softbox can also do a good "sail" imitation so that stand needed its own collection of sand bags. Wow. That's about 120 pounds just in sand bags and another forty in Century stands. I used the Nikon D810 at ISO 64 to squeeze out the most extreme image quality I could manage and also because the lower ISO allows me to get ambient exposures like 1/250th, f5.6, in broad daylight. This makes syncing up the flash easy and mostly problem free. The Elinchrom Ranger AS flash is rated at up to 1100 watt seconds of output power but I like being able to use it at half power because it recycles very quickly and I can generally get about 400 to 500 flashes out of one battery charge. I do drag along another heavy, lead acid battery as a back up but it's rare I need to depend upon it. I might have been able to make the smaller flashes work but not at ISO 64... No unless I pull a "Joe McNally" and gang a bunch of the smaller flashes together in tandem and add a radio trigger to each one. The way I figured it I knew I would have to cart and man handle the Century stands and the squadron of sand bags anyway, I might as well have all the power I needed at my fingertips. It worked well. And the gear went from the cart to a stout cart to the set up and back again. No carrying all this stuff up the steps solo. Not by a long shot. I know most people buy one type of lighting product and then get all dogmatic about their choices. They insist on shoehorning their paid inventory into every working circumstance. I come from a different age. It was a time when we customized our kits for the task at hand. It still works. The Elinchrom Brute Force Lighting Solution. The Ranger RX AS Two Head System. 1100 ws. Two heads with modeling lights. Short duration flash heads. Big, stout, speed rings. The works. the filled case weighs in at a little over 40 pounds. Not the extremely portable solution for everything.